Strike up a song with Paul and Sue Bergstrom's thumb piano handcrafted from a hollowed-out gourd. Whether you use it to strike up your own story or to teach little ones about music, Paul and Sue Bergstrom's handcrafted thumb piano is the ideal instrument to carry a tune. Atop a beautiful, hollowed-out gourd are 8 numbered tines that correspond with traditional notes on the diatonic scale. The tines, or keys, are made of tempered spring steel that is hand-cut and rounded. To play, simply cradle the gourd in your hands and pluck the tines with your thumbs. Handmade in Blairsville, Georgia. This is a unique and fun product. I would buy it again. My brother in law is a very talented, creative, and energetic guy. He's always looking around for new hobbies and musical influences and I figured this would be the perfect gift for him and his young daughters. He was thrilled the moment he opened it! Can't wait to hear what he can come up with! This gift was a Hit. My sister and her kids have at home jam sessions for fun....thought this would be a great instrument to play. We use it quite casually , we appreciate it as a musical instrument and as a piece of art. It has and makes such beautiful sounds , and looks just as beautiful. I don't have any cons about it. Great gift for a music lover! My husband loves tooling around with his thumb piano. He is a very talented musician, and was able to pick it up and play it right away. Great sound! My daughter uses it for fun. She is a percussionist at school so she loves to sit around and make music with her hands. Perfect gift for her to do this with. 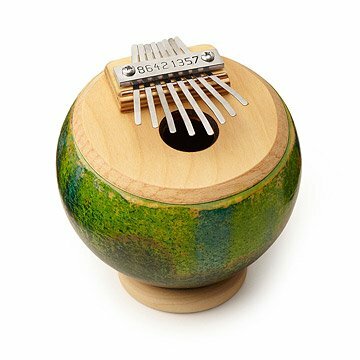 This is a very fun gift for people who have little music background. A chance to make music. Secret Santa found a great gift. Nothing negative about this gift. He will love it. So will everyone else. Well made and something different larger than I thought but perfect for leaving out as a conversation starter.